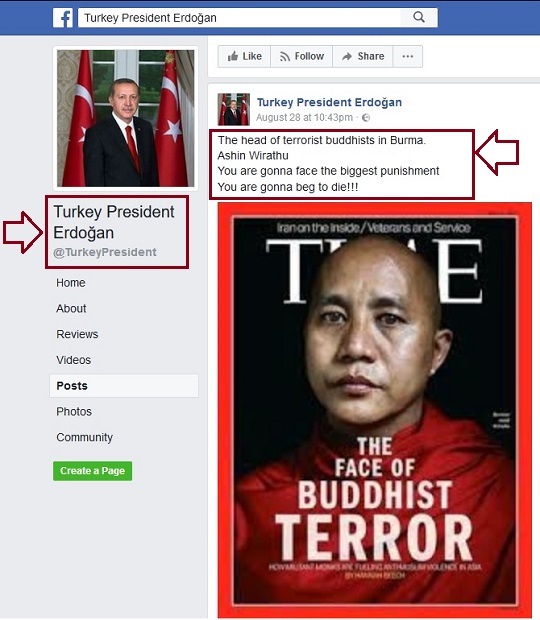 Now Turkey is leading a smear, hate, and terrorist campaigns against Myanmar (Burma) claiming that they want to protect Muslims or terrorist groups. They want to open a new Syria in Myanmar and the Philippines. This issue has nothing to do with Turkey or Islam. Turkey has no legitimate right or history to represent Muslims and support separatists. If Turkey supports separatism let them give back the legitimate rights of Kurds, Assyrians, Greeks, and Armenians first. When terrorists are hiding behind civilians and babies no one can blame the Burmese of killing them. How many Muslim and non-Muslim civilians and babies were killed deliberately, and not during fighting, by Turkic groups in their bloody history? The Rohingya insurgency in Western Myanmar is an ongoing insurgency in northern Rakhine State, Myanmar (formerly known as Arakan, Burma), waged by insurgents belonging to the Rohingya ethnic minority. Most clashes have occurred in the Maungdaw District, which borders Bangladesh. In October 2016, clashes erupted on the Myanmar-Bangladesh border between government security forces and a new insurgent group, Harakah al-Yaqin, resulting in the deaths of at least 40 people (excluding civilians). It was the first major resurgence of the conflict since 2001. In November 2016, violence erupted again, bringing the death toll to 134. During the early hours of 25 August 2017, up to 150 insurgents launched coordinated attacks on 24 police posts and the 552nd Light Infantry Battalion army base in Rakhine State, leaving 71 dead (12 security personnel and 59 insurgents). It was the first major attack by Rohingya insurgents since November 2016. Here is an incomplete list not mentioning those in Europe, Caucasus, North Africa, SE Asia, and many vassal states. Why telling the truth about the history, the acts, and the origins of Turkic groups, including Jews, is being accused of racism and antisemitism? The Turkic groups never followed any faith or God. They harmed Muslims and Christians, and all nations. They don’t represent Muslims or Islam. 2. It will condemn them and force them to pay money which they hate.